If you have not already, you will soon get a call from an Indian person claiming to be from Windows (you might be immediately suspicious as the company is Microsoft) and telling you that you have had a problem with your PC. They also might say BT, Norton, McAfee, Grisoft etc etc. In all likelihood you have a virus which has allowed them to get details about you making them sound very genuine. If you have already been scammed and you entered credit card details on your PC you should contact your bank immediately. In addition, please contact us to check & clean your PC and report the scam to action fraud (you might think this is a waste of time but unless the volume of these issues is recorded there will be little political will to solve it). Thinking of buying a new laptop ? In this note, Dave examines why he believes that many people buy laptops when they would be better off buying a classic tower desktop PC. Because of the number of factors this has been moved to a separate page. Click here to read. Unless there is a fault or a virus your PC most likely runs slowly because it is running too many programs automatically. Do you think adding another will help ? NOTE: This is not the same as too many programs installed. Removing programs that do not run automatically or data (ie pictures, music etc) will NOT make your PC faster. Having ended up with lots running you may need to call me to get rid of them. However, you can avoid these by being more careful when you install or update software. Although the vendor might recommend that you select a custom option, I advise you to pick the option for advanced users. This is just the same but you can view what is going to be installed. Having selected the advanced install, when you see options that are not essential (eg toolbars), untick them. Registry cleaners and driver updates are easy to create and lots of vendors have jumped on this bandwagon as an easy way to make money. In rare cases they have uses but mostly they will make no difference and if you are unlucky they can cause serious problems. Strictly speaking it is is a modem/router as it does both jobs. Apart from the time taken for the modem to connect again, you may find that you never get the fastest connection speed possible. Many modems (including the BT Homehub) have an algorithm which attempts to improve the speed of your connection over time. Each time you turn it off it begins all over again. So if you turn it off every day you will never reach full speed. Sometimes it is necessary for your Internet Service Provider (ISP), for example BT, to turn off the service for maintenance reasons. This is usually done overnight so you do not have downtime during the day. Your modem will retry a few times to connect but if the service is down for an extended time the modem will give up and you will still be unconnected when service resumes. Normally these last for years but if you turn off the mains it will go flat much quicker (still many months of course). When the battery goes flat most PCs just lose the time but a few lose ALL their settings and will not start ! Heat is the enemy of a computer and this is especially a problem with laptops. Most laptops have the fan inlet at the bottom of the machine and when you use it on your knees or on any kind of material surface (like a bed), it will be blocked to some degree. You will also find that over time there is a build up of fluff inside the fans small outlet fins. 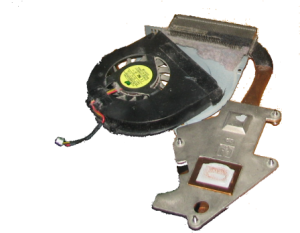 The picture shows a typical laptop fan after about 2 years of use. You can tell this has happened when the fan is always on and the bottom of your laptop gets hot. When you use some peer-to-peer programs like uTorrent, Vuze, BitLord & Sopcast that let you illegally download from and share files with other people, you are increasing the odds that you’ll get a virus on your computer. There are safe places to download files, but programs like these are not those kinds of places. As nice as it can be to share files and watch live television from all over the world, it isn’t worth it to deal with a questionable, and mostly illegal, operation. Increasingly I am finding that many of the PCs that I get in with a virus has one of these programs. Be warned. It seems like Microsoft don’t want you to know it but they have released a converter for the old versions of word, excel etc. to read the new document format. What’s more it’s FREE ! In fact, the free products such as Microsoft Security essentials and AVG are often higher in league tables than the paid for products such as Norton, McAfee & Kapersky. Remember that the more popular a product becomes the more sure that a virus maker will ensure his virus gets past it ! Most paid for products have a firewall and this might seem like a great idea but in fact all you are doing is replacing the (perfectly acceptable) windows firewall with a third party product. When Microsoft make changes you can be sure they will test their own firewall but can you be so sure about the third party products ? Firewalls are just simple ‘Yes/No’ software rules and so there is no such thing as a enhanced firewall (just more hype and expense). My vote is currently for Microsoft Security Essentials (now renamed as Windows Defender in Windows 10) mainly as there is no paid version and therefore no adverts but that may change. What are all those windows updates for ? Yet another security update ? Because everyone with a PC has Microsoft’s Internet Explorer (or ‘Edge’ in it’s new Windows 10 disguise), this is the target of a large proportion of hacker/virus/spy-ware attacks and so using ANY other browser is likely to be more secure. 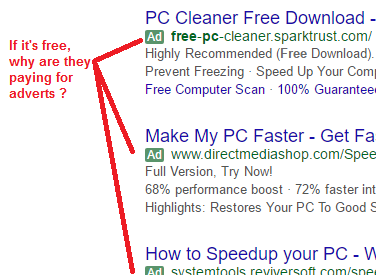 If this is unclear, the browser is the program (tool) that you use to read web pages (eg the google search page). I prefer and recommend Google Chrome as I find this is the fastest and is clear of adverts (especially with the add-on Adblock plus installed) but some other popular choices of browser are Opera, Firefox (Mozilla) and Safari (Apple).